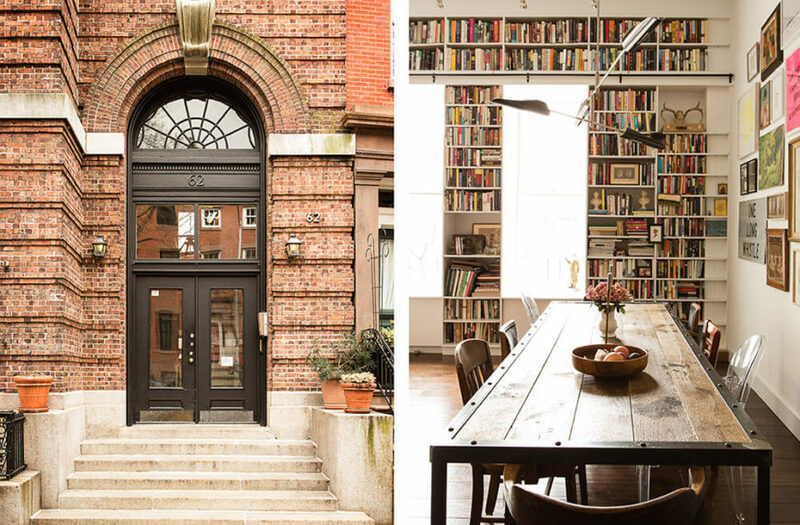 Welcome to our gallery featuring the immaculate Brooklyn Heights Loft by Ensemble Architects. This unique home occupies the top two levels of a former YMCA building that had been converted into apartments a few decades ago. 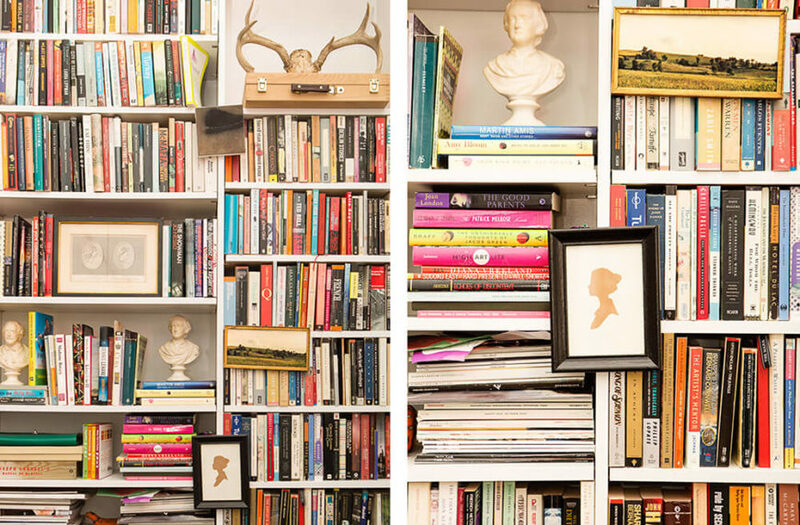 The owners needed a space where both of their individually extensive collections of art and books could coexist, and the designers delivered. The home also needed to become a great space for dinner parties and entertaining. With its large, open spaces, this extensive remodel project has resulted in a particularly satisfying home. The massive window-framing wall seen in the open living and dining room area has been completely covered with adjustable bookshelves and window seats, performing a stylistic double duty. The shelving not only displays the owners’ collections; it also obscures the radiators and helps to emphasize the grand scale of the room. At the center of the home, a large steel staircase has been “redressed” to create a luxuriously sculptured stair reminiscent of the original, ornate building entry stair. It’s a showcase element in an already gorgeous home. 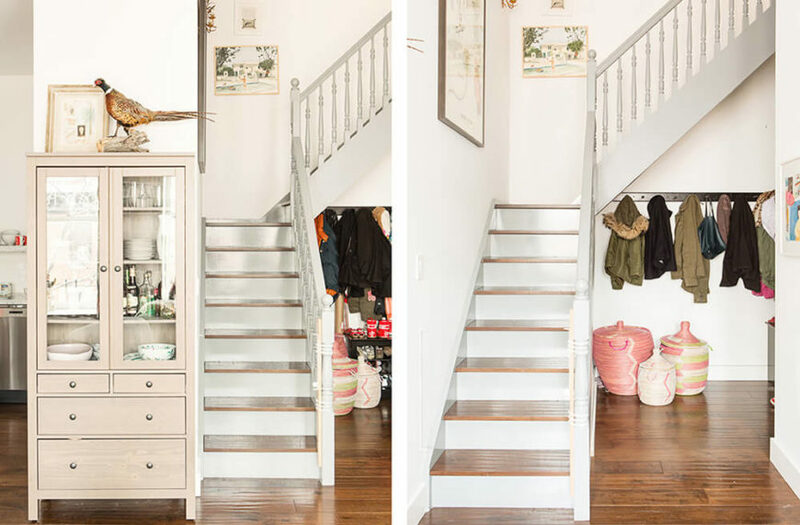 Beneath the staircase, a line of painted wood hooks was hung for easy and open coat storage, creating a useful space where most homes have an empty void. The entry is improved with an attached powder room that’s entered through a refurbished salvage door. With vintage wallpaper and chandelier, it’s a uniquely styled, intricately designed cozy space. 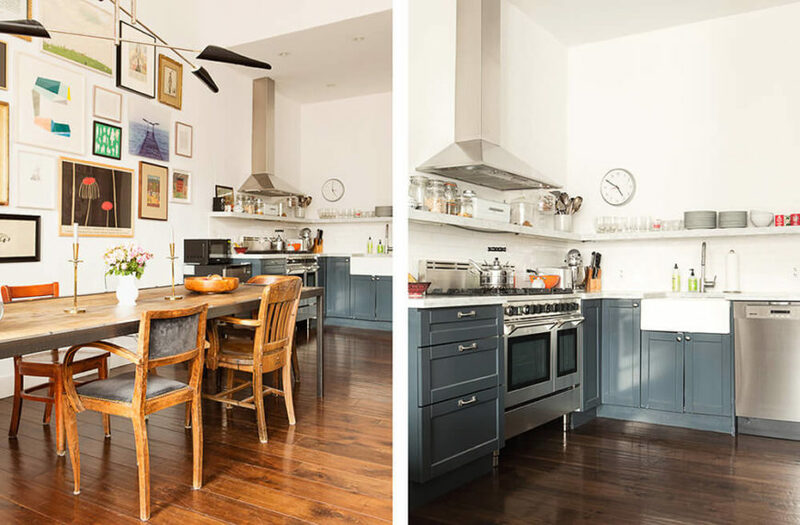 The original dark, cramped kitchen has been completely replaced with a brand new open-plan update, flush with contrasting cabinetry and stainless steel appliances. The designers even found a nearby unused space to create a walk-in pantry. The home is about as striking as they come, with a timeless look courtesy of old construction and modern renovation. To the left, we see the front entry of the building, with classically ornate brick work and large windows over the door. To the right, we see a closer look at the dining table in the large open plan room at the center of the home. 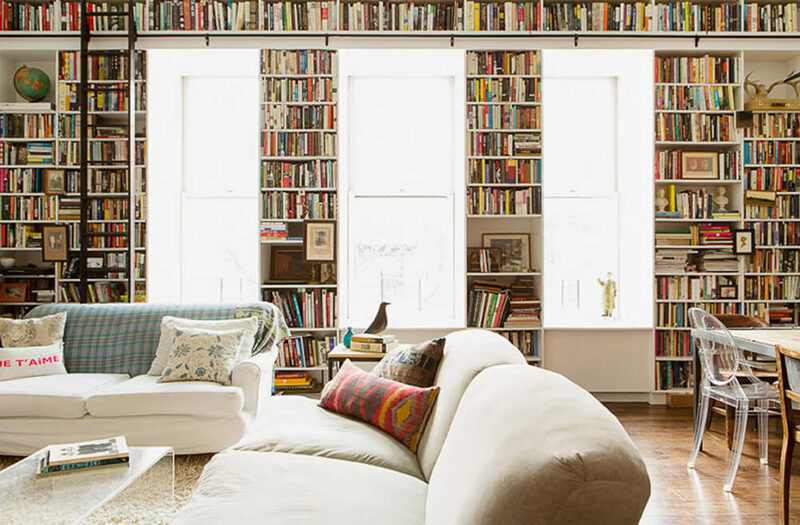 The huge living and dining room space is utterly dominated by bookshelves from floor to ceiling, framing large windows with built-in seats for enjoying the surrounding views. 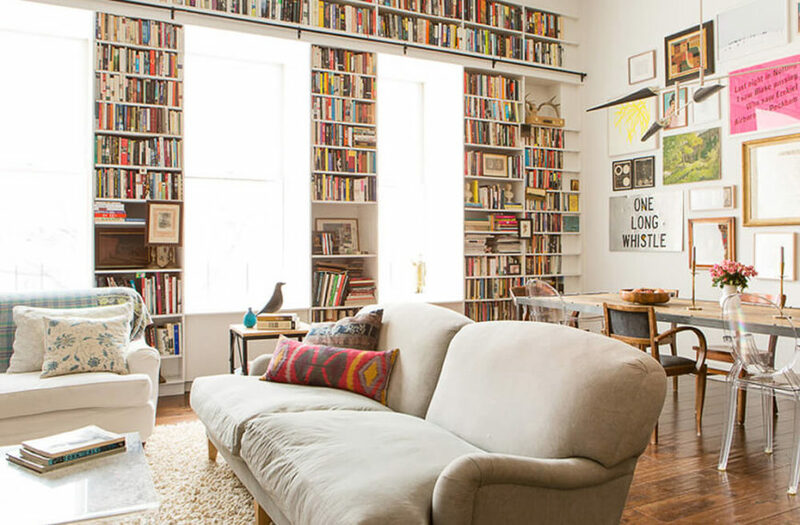 Along with thousands of books, accessible with a built-in ladder and runner, the room is filled with artwork from top to bottom, as seen along the right wall and dotting the bookshelves. The furniture here is a combination of contemporary and traditional styles. The dining area centers on this large rustic industrial table, with a wood top framed in steel. The eclectic collection of dining chairs showcases the homeowners’ artistic ambitions. Turning toward the kitchen, we first see how its open design interacts with the dining and living room, at left. At right, we see the sleek stainless steel appliances and dark blue cabinetry offering a bold contrast to the pristine white walls and countertops. The rich hardwood flooring connects the various spaces. At the bottom of the staircase, we see both an ornate, traditionally styled display case at left, with the kitchen in the background, and the under-stairs coat storage, at right. In one of the bedrooms, we see more refurbished antique furniture like the distressed wood dresser next to a plush roll-arm chair. 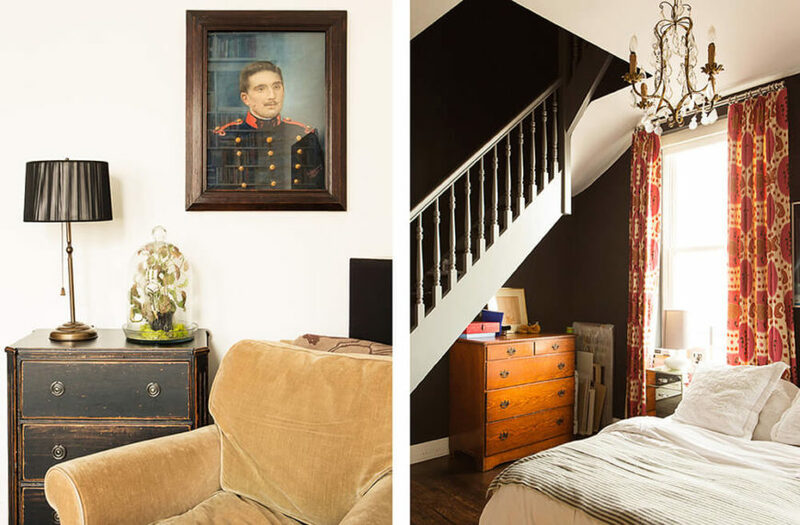 Beneath this separate staircase, we see a rich wood dresser and an ornate chandelier hanging over the bed, at right. 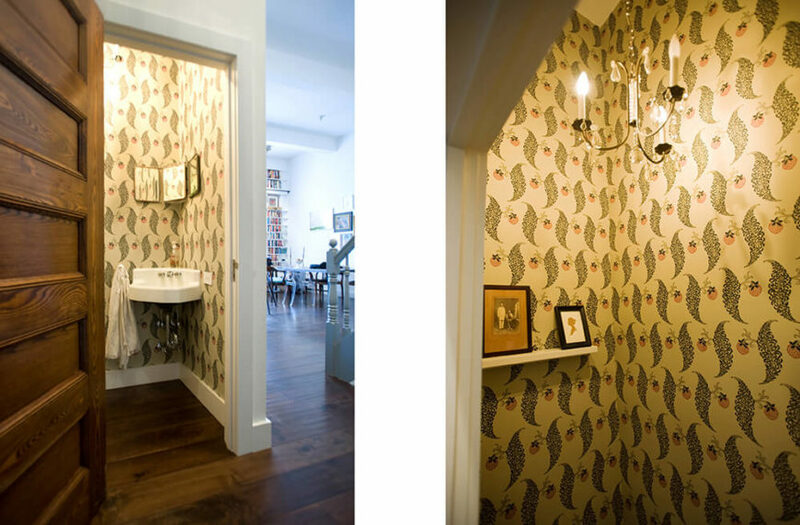 Now we get a look at the smaller entryway bathroom, with its refurbished salvage door and detailed wallpaper standing out. Above the unique corner sink, we see the ornate chandelier hanging, along with a small floating shelf in white. Here’s a close look at the bookshelves, with their modular heights and varying configurations designed to hold books and artwork in a variety of ways. 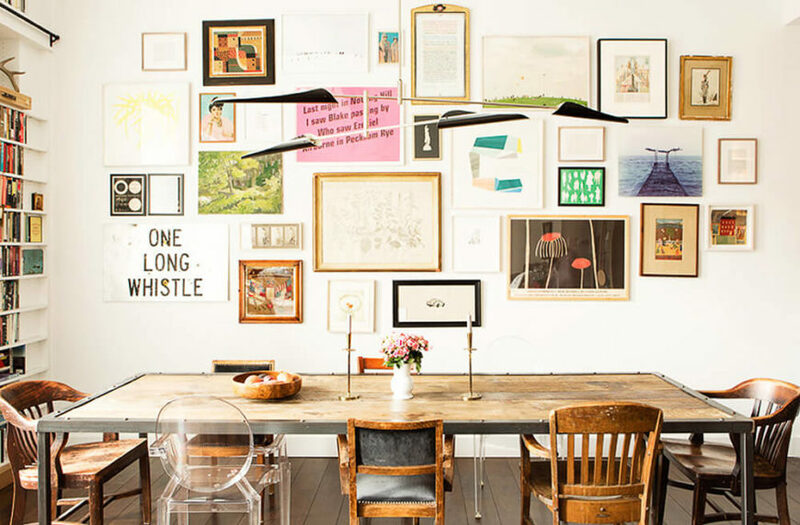 They completely dominate the room and stand as the defining element of the home. 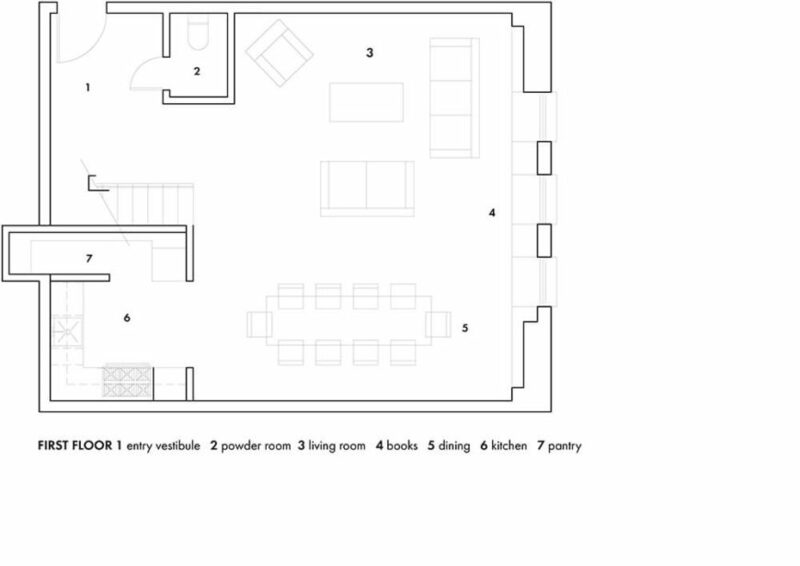 Here’s the floor plan for the first floor of the home. Note the incredibly open layout. 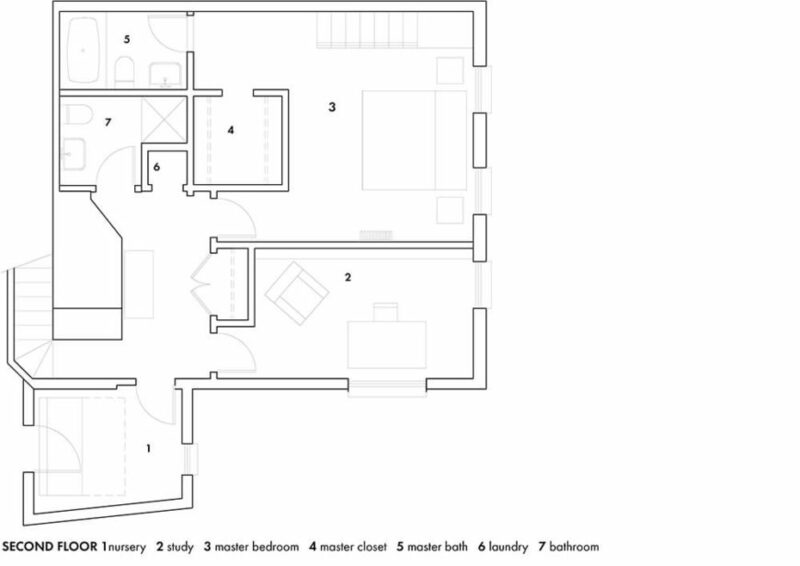 The second floor features the more private areas of the home, including bedrooms and master bath.